Most of us are gearing their wardrobe up for autumn where layering is a must. 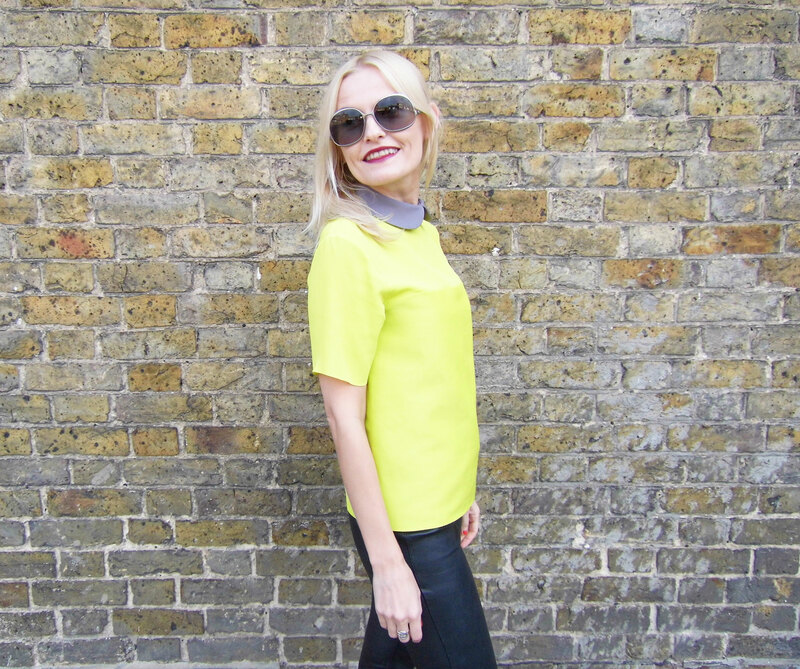 I, however, am still holding a strong grip on the bold colour block silk tops I grew to love over the past few months. This is my take on how to match silk with leather. Love it, hate it? Let me know. 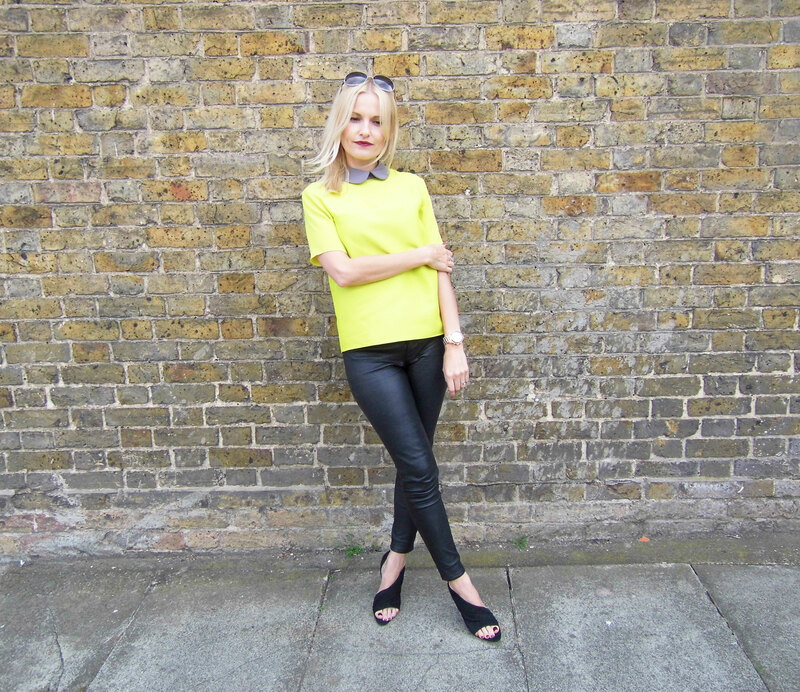 I love a splash of colour in my outft, be it a work wear or a going-out attire. 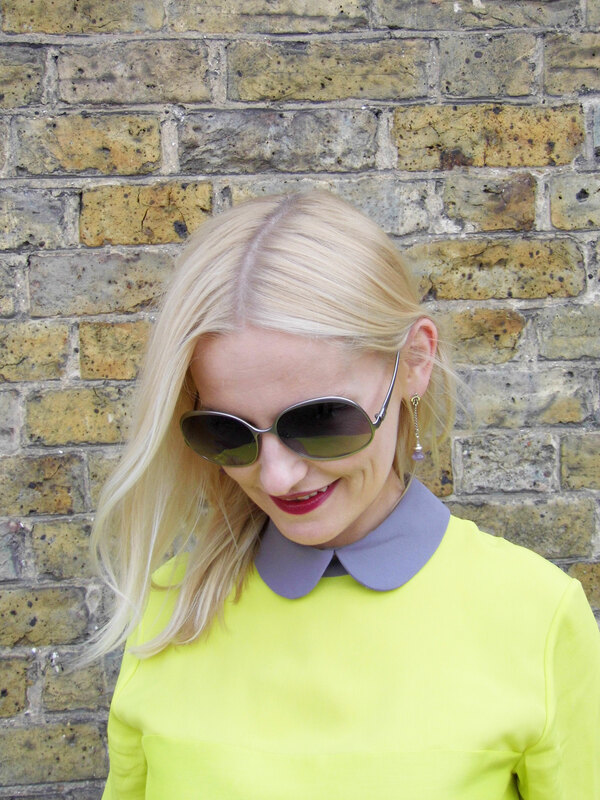 When I spotted this gorgeous ROKSANDA ILINCIC Light yellow Estes Charteuse T-shirt on matchesfashion.com I knew I had to have it. 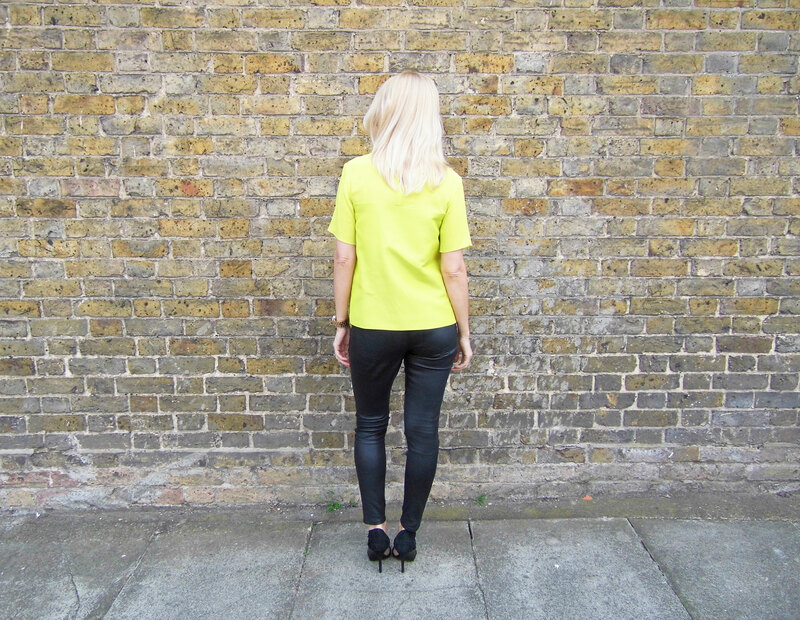 This chartreuse-yellow silk-crepe blouse makes a bold and colourful statement. 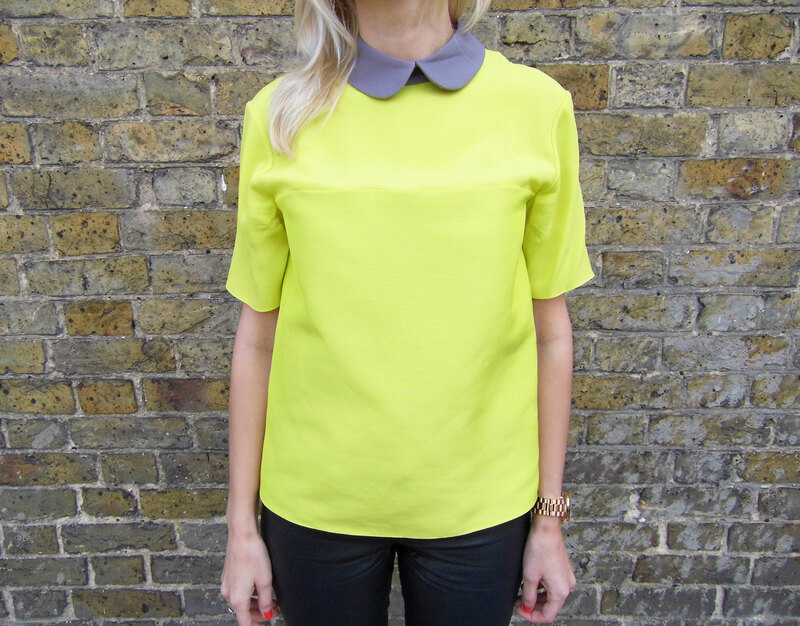 I love the contrasting grey Peter Pan collar, closely-fit round-neck with a back-neck hook and an over-sized silhouette. The juxtaposed textured silk and crepe front panel make it definitely a very interesting mix. The striking pleated suede, cut-out side and an open pointed toe make these pumps even more appealing, channeling Wang’s enticing nonchalance. 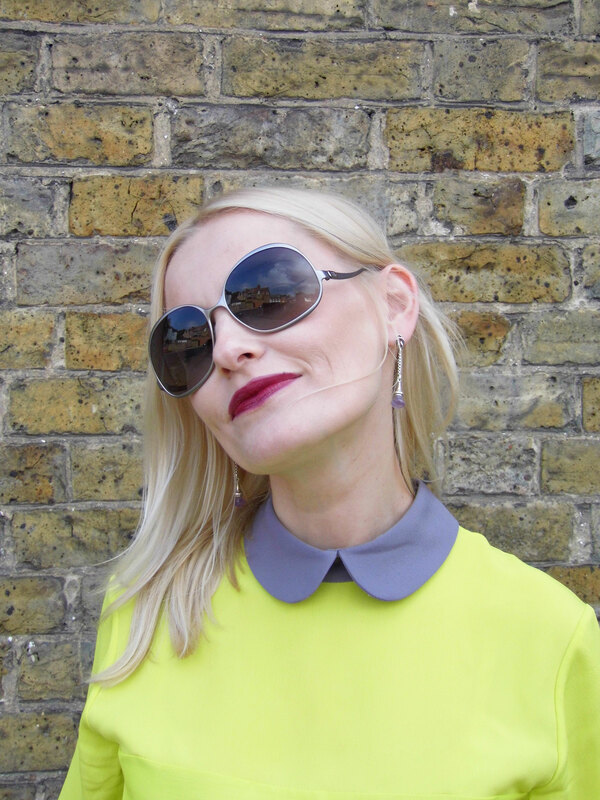 I put on these super cool Balenciaga round frame gunmetal tone sunglasses with dark grey lenses, to finish off the look (on sale at theoutnet). I love the grey matte finish and slightly curved dropped designer-stamped arms that give off the maverick look. 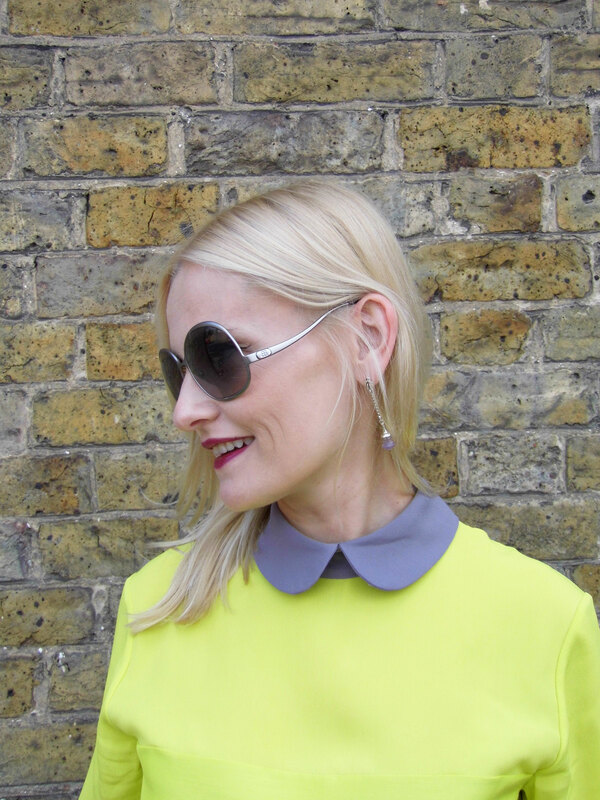 I have accessorised with my favourite Links of London sterling silver Annoushka dome amethyst drop earrings. 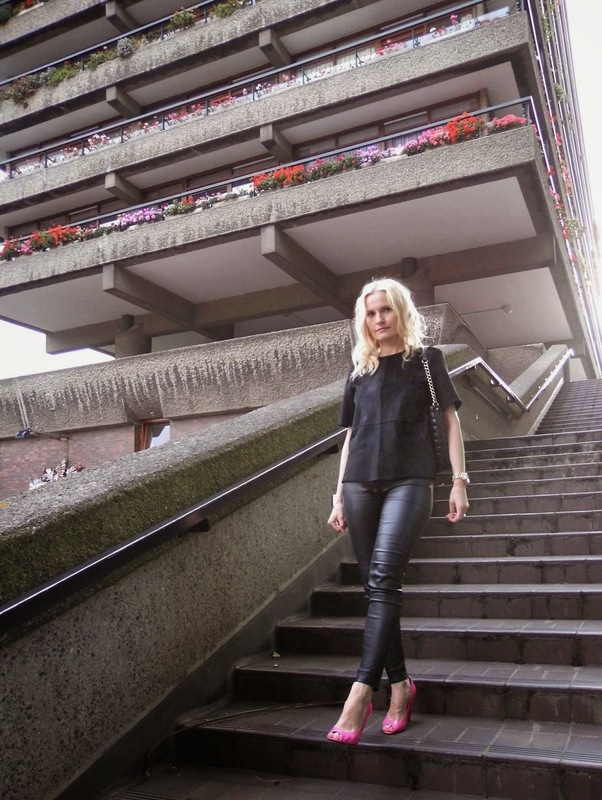 I have recently worn this outfit for the Bloggers Love Fashion Week Gifting Event and it was the ultimate test to its wearability! Stylish and practical – what else you need? Follow me for regular style posts. 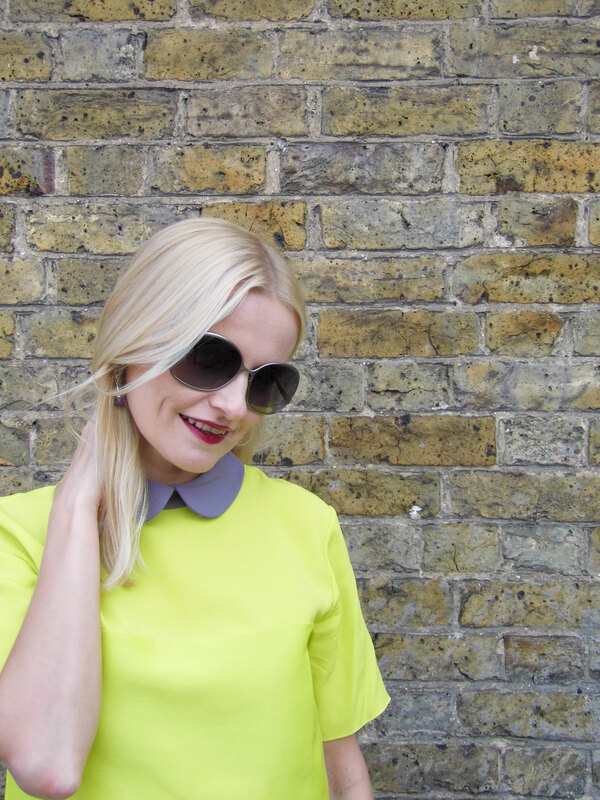 Dreary weather inevitably dampens my spirits – particularly when the downpour unleashes itself onto my newly blown dry hair – but instead of following the suit and dressing in black and grey, combat the gloom by adding a splash of colour to your outfit. On my Paris weekend getaway I took a walk on the wild side of Boutique by Jaeger by wearing these fierce multi-coloured 60-ties inspired Leopard print trousers, still available at Jaeger website at a very reasonable price of £29. They are perfectly cropped and tailored to a very flattering fit and I really like the pure cotton feel and purple/orange hues infused to the print. Injecting the colour might not make the sun come out but sporting a fun hue certainly keeps things playful and is the coolest way to combat rainy blues. I wore them with a monochrome bow T-shirt from Topshop I bought some time ago. 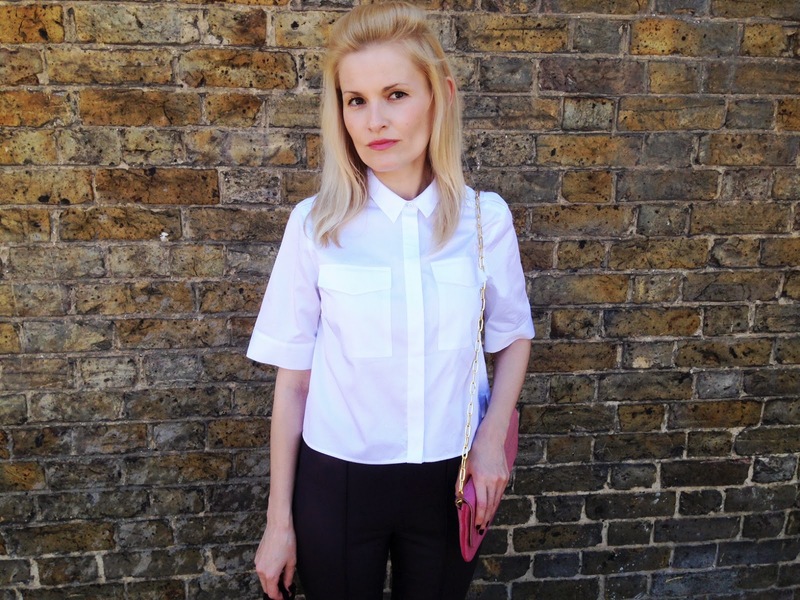 This very simple yet striking top always goes a long way when I just don’t want to try too hard. While, the bow makes it cute and girly, matched with these fabulous trousers it unchains fun and fierce look. My shoe choice was L.K. Bennett – these Selina Mock Croc high heeled courts are simply gorgeous redefining glamour. The utterly modern silhouette is complemented by the fresh interpretation of the classic bow design that just dazzles. There was nowhere to hide from pony skin last winter. As a result, pony skin was the most sought-after textile of the season which brings me to this hot to trot Hobbs London Ivette Top. Perfect for day or night, the ponyskin feel is luxurious to the eye and touch while the T-shirt design gives it a nonchalant edge. But how to wear it? With texture, very much like print, mixing things up is key, so don’t be afraid to clash. 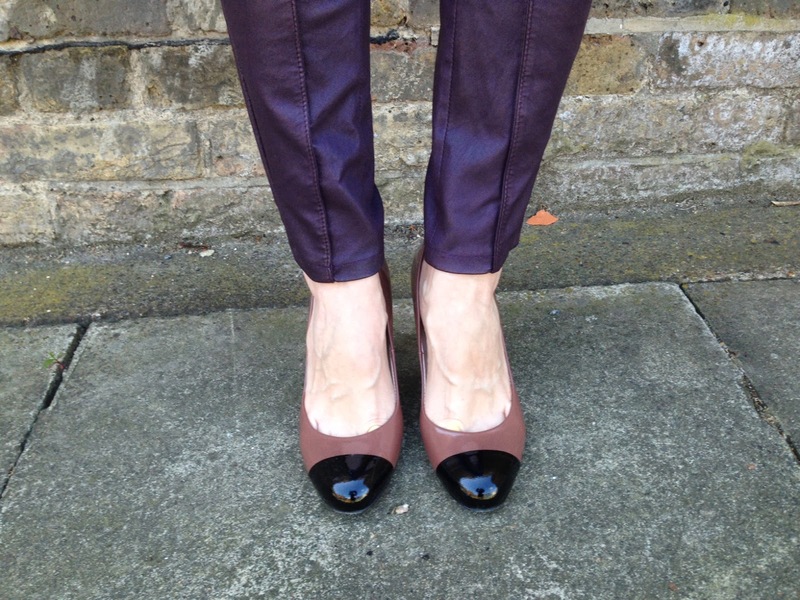 Leather trousers look great, I paired it with bright Fuchsia Marc By Marc Jacobs peep toe shoes. I really like its soft leather varnished effect and covered cone heel. 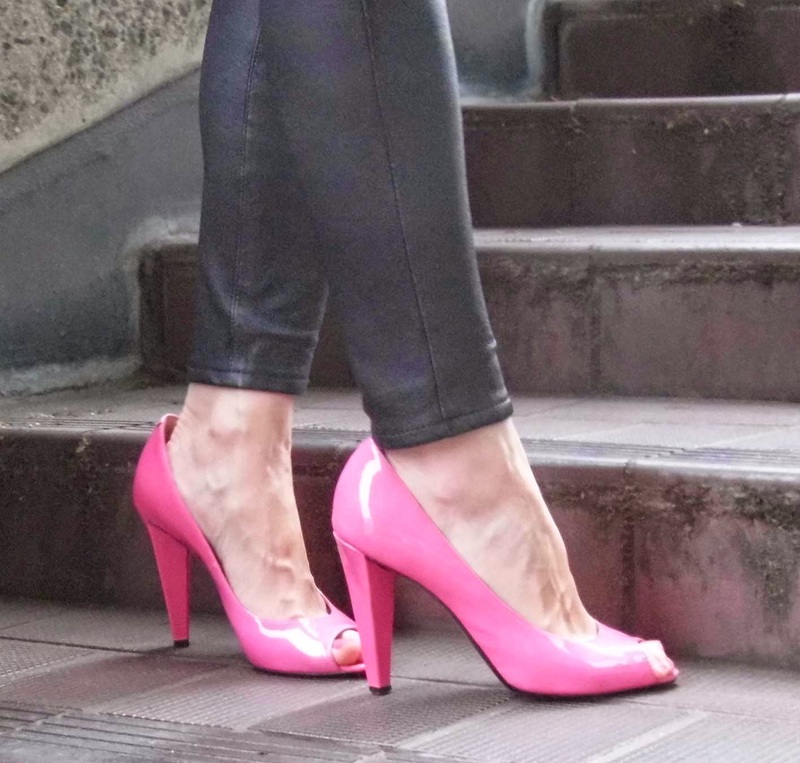 The pumps look and feel great, still on sale at Yoox. Twenty8Twelve ‘Isiadore’ Stretch Leather tapered ankle pants (size US2) are probably one of my favourite pair of leather leggings, ultra-cool and super fitted with clean seams and supple stretch leather sculpt they look fantastic with a crisp white cropped Epaulette cotton shirt by Whistles. On cooler days, opt for a sumptuous knit for extra warmth. I have added this super slick EREMETT pink Stingray Leather Clutch oozing sophistication and LK Bennett Bruton pumps to finish off the look. This black leather shirt dress by Jaeger is one of my recent additions to the leather edit. I like the simplicity of the cut and a sharp design. I teamed it up with Lamb 1887 Portofino Clutch bag in beige and Surface to Air Ela V1 towering platform sandals featuring snakeskin-embossed straps with adjustable buckles and a chunky heel. Love this effortlessly chic look.